On the morning of Jan. 19 in Philadelphia, there was a bracing cold with a blustery wind. It was a raw, gray day where just being outside sounded daunting. That wasn’t the case, as thousands rose and got ready to march. The 2019 Women’s March still took place, and with a Government shutdown still in effect, there was reason enough to brave the temperatures. For the third year in a row, thousands of women and allies across the United States marched through their respective cities. However, this year wasn’t as united as before. Back in December, news broke about turmoil relating to the National Women’s March across the country, as allegations of antisemitism rose to the surface. Women’s March Inc., a national organization who emerged from the first march in Washington, DC in 2017, came under fire for being associated with Nation of Islam leader Louis Farrakhan — who is known for his antisemitic tirades — accompanied by claims of injustice in their own meetings. The ripple effects of this information not only caused several big organizations — the Democratic National Committee included — to drop partnerships, but it also caused divides in cities’ march plans. This resulted in many cities having multiple marches Jan. 19. One of those cities was Philadelphia, which had even deeper divides between their organizers. Emily Cooper Morse, the woman who founded the organization that put on the Women’s March on Philadelphia, was accused by her fellow board members of racist and transphobic remarks, as well as removing funds from the organization’s bank account. Philly Women Rally, the local organization that spearheaded Philadelphia’s first two women’s marches, was able to rally for the cause of the third Women’s March. It was a tale of two rallies on Saturday morning. Philly Women Rally and Women’s March Philadelphia held permits to opposite sides of the Benjamin Franklin Parkway. Although not everyone knew the nuanced differences between the two, there emerged a clearly more profound rally. The lesser of the two was held by Women’s March Pennsylvania. The march was in Love Park where people gathered and rallied next to City Hall. The march that garnered the bigger turnout was the location where the previous marches were, and included the Philadelphians who started them. Philly Women Rally started at Logan Square and marched to the steps of the Philadelphia Art Museum. There, many prominent speakers had their chance to share personal accounts, words of inspiration, calls for even more women in elected and appointed positions and to discuss the necessary forward progression for women’s rights throughout America. 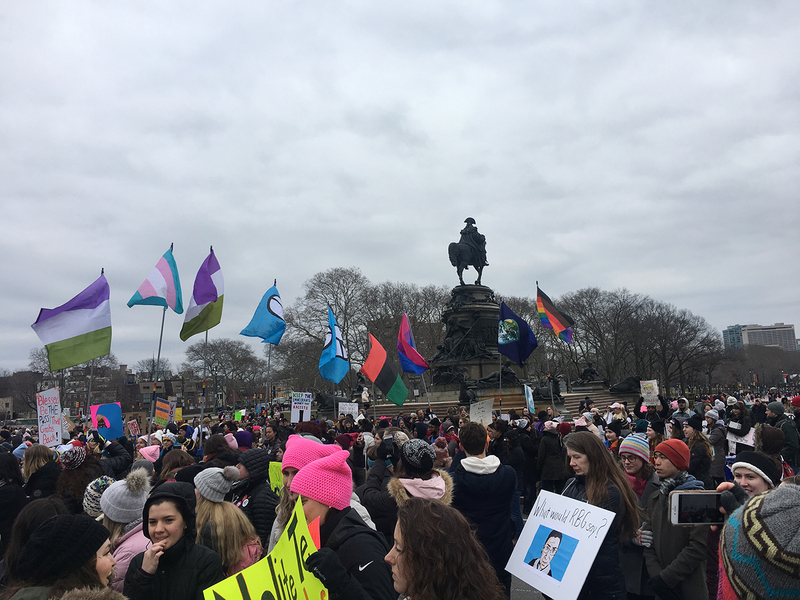 Drexel freshman Madison Betts attended the Women’s March. If there was one clear takeaway, she felt that the greatest impact came from the people who contributed the most. “The people who were behind the march were really dedicated and educated about why they were marching, which I think is even more important now,” Betts said. Arguably, the biggest speeches during Saturday’s march came from three of the “Fab Four”: Pennsylvania’s largest contingent of women ever to be elected to the House. They took the stage together, sharing the mic and the platform they had with power. U.S. Rep. Mary Gay Scanlon of Delaware County, U.S. Rep. Chrissy Houlahan of Chester County and U.S. Rep. Madeleine Dean of Montgomery County made up the trio of elected women present. Meanwhile, U.S. Rep. Susan Wild of Lehigh Valley attended her hometown march in Bethlehem, Pennsylvania. Other speakers included lawmakers and elected state and city officials, as well as survivors of abuse. Despite the turnout being a lot smaller in comparison to previous years, the 2019 Women’s March had a significant impact on Philadelphia, with many road closures and detours put in place for the march itself. “It seemed to be a check-in on the state of things, to see the movements that are still working towards something more,” Drexel freshman Clayton Fosterweber said. Speakers, marches, weather and discourse aside, the Women’s March was a national event once again with Philadelphia among the multitude of cities who contributed.